Tonight I almost started writing about Seven of Nine. But I realized I couldn't move on until I acknowledged the loss of one of the series primary characters: Kes. I loved Kes in spite of the fact that there weren't a lot of great stories for her. She had an abundance of qualities that have always been attractive but a little alien to me. Her feminine, gentle, and self-sacrificing nature brought a warmth to the show. She found a family on Voyager, especially with The Doctor and Janeway. She grows up and, as Janeway points out, has spent almost her entire life onboard. She leaves in The Gift and her scenes with these characters never fail to make me all weepy. 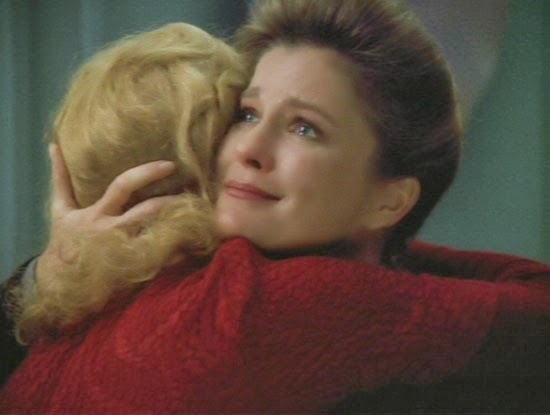 It seems obvious that Janeway's goodbye with Kes is as much these actors and friends saying goodbye as it is about the characters. As much as I love Seven, I'll miss Kes. And, I'm both looking forward to and dreading her return in Fury.